I always believed that by the beauty of words, one could change the world. His weapon was the word, and his horizon utopia. Armand Gatti, who died on Thursday, the 6th of April at the age of 94, lived his life fighting with words made weapons, first as a journalist, then writer, poet, film director (in 1960, he films L’Enclos, a drama set in the world of the concentration camp and in 1963, El Otro Cristobal, a reflection on the Cuban revolution), then in theatre, where, with those without name, those at the margins, the forgotten, those without voice and the excluded, collective stories were forged, stories that created new worlds. His passion and energy made him nomadic, multiform, prolific, but always engaged in resistance against the arbitrariness and violence of power. Born to a poor family in Monaco – his mother worked as maid and his father was a street cleaner and anarchist militant – he would fare poorly in school. Suspended from a seminary school, in 1941, he joined the french resistance. Captured and condemned to death in 1943, he would be pardoned because of his young age, only to join the Free French military in britain. After the war, his creativity would take him to seemingly all fronts of struggle, and through words, and he would give give voice to the rebellions and the dreams of the oppressed. In the resistance, Gatti assumed the name of Don Quichotte. In his work-passion, he would remain a Don Quichotte of desired worlds. 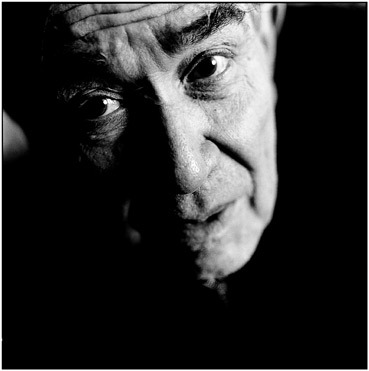 A leading figure in theater, poet, dramatist, journalist, Armand Gatti celebrated his ninetieth birthday yesterday in Montreuil, at the site he calls la Parole errante (Wandering Speech). With bright eyes, a slightly mocking smile, Gatti can’t help showing his interviewer a tiny sign. Attached to the back of his jacket, always, wherever he is, under any circumstances, the portrait of Buenaventura Durruti, the charismatic figure of Spanish anarchism. It’s his own “Legion of Honor”, which he wears with pride. This one, no one awarded to him. But it gives testimony at every moment to his engagement. Armand Gatti, anarchist from top to toe, as rebellious as Durruti, with an impressive pedigree: maquisard  at fifteen years of age on the plateau of Millevaches, arrested, condemned to death, escaped, arrested again, he will be deported … He is no survivor who returns from death, but a combattant for life, a witness who throws himself body and soul into writing. At first, as a journalist, and what a journalist! He wins the Albert-Londres prize in 1954, then turns toward the theater after Vilar stages one of his plays. Because it is the theater that gets under his skin since that evening, in one of the camps, that he attended a drama acted by rabbis. In the confusion of the century and in feelings, this memory remained firmly anchored, shining like a fire-fly in the night, all those nights when he was on the side of the oppressed, with his brothers in combat, in Northern Ireland, in South America, or standing with the youth of the working class suburbs. Gatti confides to us that he has three mentors, Vilar, Piscator (the founder of proletarian theater) and Mao-Tse-toung. But also and especially Michaux, Rimbaud, Gramsci, whose books were in his sack the day he joined the maquis. Poets, like himself; free men, like himself; rebellious, like himself. In 1986, he settles in Montreuil, in the former studios of Méliès Le Parole errant is born, a proteiform locale open to all currents. With Hélène Chatelain, his son Stéphane Gatti or with Jean-Jacques Hocquard, they have made of this place a living locality, which palpitates with every encounter. In recent days, a festive air drifts over Montreuil. One passes, one stays, one leaves, one comes back. Armand Gatti, with his ninety springtimes, never stops working. The virus of writing, always and again, when he puts on his work-apron as on the first day, he never quits. Gatti was born in Monaco, like Leo Ferré. One may believe that “the rock” gives rise to some surprising wild plants. All the works of Gatti are published and republished. Just appeared, in December, the recent issue of Cahier Armand Gatti , Du journalism” . On 1 February, at 14h and at 19h, at l’Enstatt in Lyon, a meeting with Armand Gatti, hosted by Olivier Neveux. George Méliès, French filmmaker, inventor of many methods of “trick” filmmaking, who opened the first film production studio in France, in Montreuil. My position is very simple. I start from the principle that each person is a sun. Obviously, there are different kinds of suns … With some, it is considerably weakened … But there is always a light, always, regardless of the person … The worst petty municipal bureaucrat, the worst, one starts from the principle that there is still something there, a little light … Thus, with everything, it is a concern with finding the dialogue, to create bridges of words to enter into contact with her/him … All of the experiences, I begin by saying: “In the beginning was the Word and the Word was God. Do you want to be God with me for a year?” A journalist asked me one day: “You, you take yourself for God?” However: “In the beginning was the Word”: it is very clear. Do you want to be the Word? That means: Do you want to become conscious that you are a creation, a light? Are you capable of it? That is all. It is the only thing I ask … Do you want to be God with me; coming from an anarchist, this makes a lot of people laugh. There is therefore this sort of encounter with the Word of those who are dispossessed. First, one has to give words their meaning. To explain, to explain anew, and above all, at a given moment, try to put into action this word that is not always evident at the beginning. As we are engaged in representation, there is not simply something written. There is also the human that is there, and not as an escape. It was necessary to find a writing of the body. There are very few. And the few languages that remain have most of the time degenerated … After some research, we found something where we always find something, in China. China is very important. The basis is true Kung Fu. There is the idea of a combat between the serpent and the bird. The serpent lacks teeth to bite, as well as feet to run, wings to fly, a beak to pick … It is there, it tries to fight and finally it tires the bird that finally departs. It is a combat that is won by a non-combat. It is thus s/he that we have taken as at the basis of culture. When someone asks me what it means, the excluded, I answer that my problem has not to do with the social. I have a reputation, everywhere I go, of struggling for the social … Oh, not so fast! Be careful! I did not come to manage the misery of the system. What interests me is not unemployment, but the unemployed. It is the person! Fundamentally, her/his existence and plenitude as a human being! Evidently, these are people condemned by language, who do not know how to overthrow their bad destiny. And when someone speaks to me of the “excluded”, I say: excluded from what? Excluded from the life that assumes the language, little … travestied by all its defects? Excluded from words that seek to out bid each other? Excluded from language that can only make the sound of an empty shell, empty of meaning, and of which nothing will be retained? Why do I do all of this? In the beginning, it was so that others could gain awareness of their Word, of their words. Revolutions only exist from the moment that they are vehicled by language. There is not only the language. And I do this so that [those who participate in creating the play] be more beautiful on leaving than they were when they entered. Voilà. Through words, we begin to be masters of our destiny, one names things, one makes them exist. And it is very simple: when words inhabit someone, suddenly, there is something else that happens. One’s look changes. One is no longer the same. For further and detailed information on Armand Gatti, see the Armand Gatti website, the website of La parole errante and the Armand Gatti archive. This entry was posted in Commentary, News blog and tagged anarchism, Armand Gatti, Art and Revolution, france. Bookmark the permalink.